On October 10th you’ll be asked to vote for an MP in Ontario and also asked if you would like to change the electoral system here. Please make sure that you vote and please help us change our electoral system in Ontario. Right now your vote only counts for your local MP, and that local MP probably belongs to a party, and the party with the most MPs is put in office and has their leader become Premier. This new system will give you one vote for your local MP and one vote for a party that will be diveded up amongst lists submitted by the parties in advance, a system known as Proportional Representation (PR). If in every riding let us assume that Ontario votes 32% in favour of party A, 29% for party B and 29% for party C more. In this example people voted against the party in power than for the party that now has 100% of the power! Those votes for party B & C are effectively wasted, when one considers small parties like the Green party or Marijuana party (they’re on a roll) those “wasted” votes can be enough to elect one person, but because they are spread out across the province the current system shuts-out these parties. Right now your one vote isn’t for the party in power, just your local MP, and that person could change parties. In actuality the party in power and the leader probably have a greater influence on your life than your local MP. Why this purposed system with some Proportional Representation, where you vote for a local MP and cast a separate for a party, is better than the current system. As you may-or-may-not-know my soon-to-be old place in St. Catharines does not have air conditioning, and particularly in the summer of 2006, this was not easy to deal with. To cope with the heat and humidity I took a leason from Geoff Milburn, former University of Waterloo, and formally famous inventor of the home-brew air conditioner. Basically the system works by having a source of cold water, preferably with ice (I liked using 2L jugs with a little salt in them in order to keep them slushey) which you symphen through the fan and out a window and preferably into a garden etc (it was a little salt). I don’t need it any more because we have real AC in Burlington so it’s free to anyone who can pick it up from Markham or BrockU. 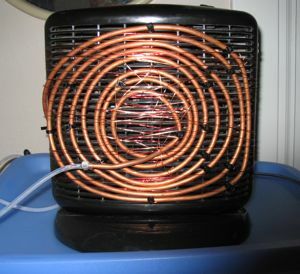 Does this homebrew AC make you green with envy? The Smashing Pumpkins – SOOOOOO Good! I’ve never heard Billy sing so well. Everything sounded great, and the even played what I was hopping for, Siamese Dream’s “Hummer”. 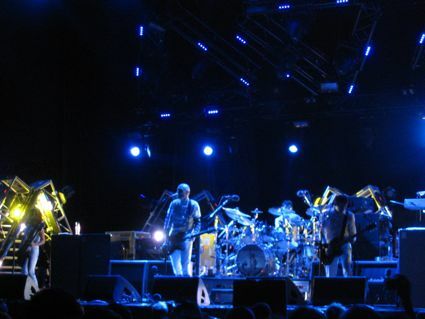 Highlights also included a “Tonight, Tonight”, “Tarantula”, a Billy-only acoustic of “1979″, and a “Today” as an encore. I was disappointed with the organization. If I want a beer why do I have to line up, have my ID checked, as bartender where I buy the beer, leave the beer area, line up at the cashier tent, have my ID checked, buy tickets, line up again a the beer area, order a beer. Could have those steps by eliminated if someone wrote somewhere “1 Beer requires 1 beer ticket from cashier tent”. For the record, my famous Belgian Waffle (I turned around to a guy filming it and me) didn’t require a ticket. You may recall that in April I changed the rear rotors on my Acura 1.7 (“The Super Civic”). The Acura 1.7 EL and the American Civic Si are the only two version of this world Honda platform that use rear disc brakes over the not-so-sporty drumb brakes found in the regular Civic. The front disc brakes set up on all of these cars are the same. This summer my front left rotor started to warp as one would expect with its age and I figured that the front rotors need an improvement of quality for the vehicle to meet it’s ultimate potential — and now it does! The best news is if you read this article the whole way you can learn how your Civic 2.0 SI 2002-2003, Civic/EL 1.7	2001-2005, Civic 1.6/EL 1989-2000 or Del Sol VTEC can have the same part cheap! I did some relatively extensive research on the best option. I wanted brakes that would give good feel, stop hard and look cool but at the same time be street-able and cost-effective. This ruled out bigger rotors, as I didn’t want to change the calibers that clamp down on the rotors. Additionally, I had purchased carbon pads for all of the calibers back in April , I wanted to re-use those. Ultimately this meant increasing the efficiency of the current rotor dimensions. The part I needed turned out to be Magnum Original Cross-Drilled Rotors. 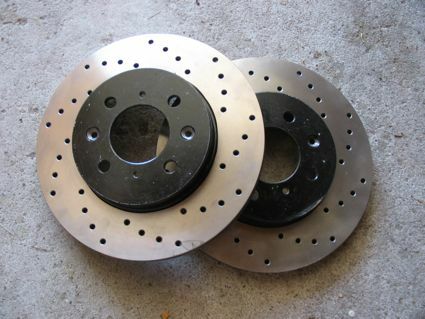 Magnum Cross-Drilled Rotors are Canadian made rotors that have holes in them that allow the gas created by the extreme heat of breaking to escape into the venting between the two surfaces of the rotor. This keeps the rotor cooler and prevents the “float” effect of gasses or water building up between the rotor and the pad. An other technology is slotting, which is an actual grove that pushes hot gasses away – that level of venting is really only needed for racing and not my street car. You are currently browsing the iMatt :: The Blog of Matt Clare weblog archives for September, 2007 .